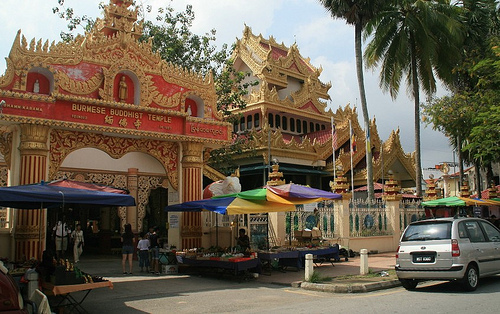 The Dhammikarama Burmese Buddhist Temple is located at Burma Road (Lorong Burma), in the heart of Penang, Georgetown, Malaysia. 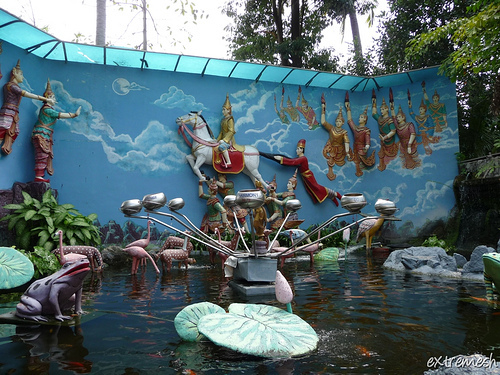 The temple is situated right opposite to the famous Reclining Buddha (Wat Chayamangkalaram). 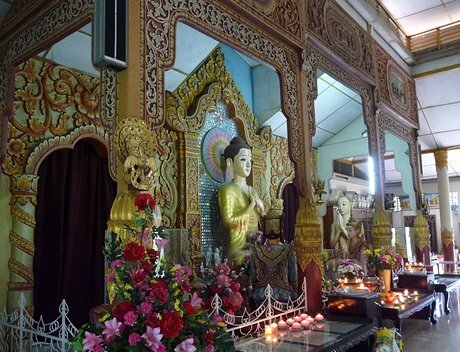 The temple was known as 'Nandy Moloh Burmese Temple' back in the 80's. 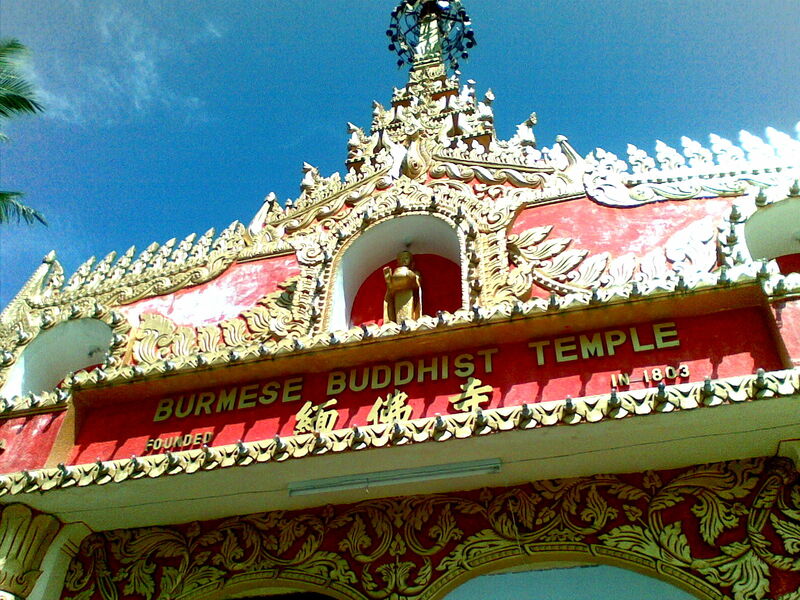 It was founded in the year of 1803 and this makes it the oldest Burmese Buddhist temple ever built in Malaysia. It is the only Burmese temple located in Penang and so tourists flock to the temple to visit this preserved site every now and then. 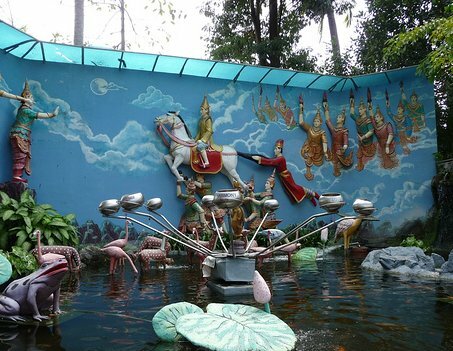 Not only an ordinary temple was this very temple awarded the first prize in Penang State Landscaping and Beatification Program competition dating back in 2001 with its green and tranquil environment. The main attractions of the temple are the historical Pagoda, a 200 years old well and the huge all-marble Buddha statue. 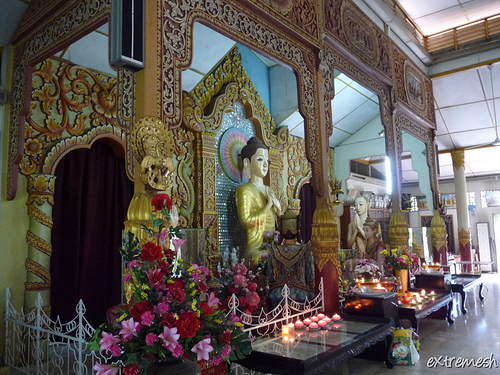 The temple is rich with history as this temple marks the occupation of the Burmese in Penang. There is also an interesting feature of the temple where paitings are hanging around through the walk way, explaining the journey of Buddha. Throughout the year, the temple organizes some activities and celebrates related festivals including Wesak Day, Water Festival and Festival of Light (Soon Dawgi). Activities carried out are Sunday Classes, Katnina and Meditation Classes, just to name a few. For all beach lovers, it is a must to go to Batu Feringghi beach and experience the cool breeze. Batu Feringghi beach is located around 18km away from Georgetown. It is popular with its white sandy beaches and the adventurous activities it offers. There are water sport activities such as canoeing and also sailing. Besides that, you can experience a horse riding along the beach. The beach provides a serene and peace environment, definitely the best getaway from the hustle bustle urban life with heavy traffic non fresh air. Many 5 stars and well known hotels in Penang are situated there too for example Hard Rock Hotel, Golden Sands Resort and Bayview Beach Resort. When it comes to food and shopping, take yourself to Gurney Drive (Persiaran Gurney). You can have a taste of all Penang's famous local food including Assam Laksa, Rojak and Hokkien Mee. There are stretches of stalls selling all of these hawker foods. Be sure to empty your stomach before you dig in. Take a walk to the nearest shopping mall Gurney Plaza and shop till you drop. The mall provides a large variety of outlets selling clothes and also gadgets. Take the Rapid Penang Bus numbered 101 from Georgetown. You can catch this bus from Chulia Street, which then goes to Komtar and Jalan Burma. There are other buses that run near to the temple with numbers 10, 103 and 104.You can also take a cab to the temple from anywhere in Penang. The ride will cost a negotiable amount of RM40 form Georgetown to the Dhammikarama Burmese Buddhist Temple.